It was the main event bout that Muay Thai punters have been waiting for, the long anticipated rematch between Superlek and Panpayak, two of the best gunfighters in Bangkok today. Standing in for the OK Corral was Rajadamnern Stadium in Bangkok, packed to its creaking wooden rafters with touts and gamblers eager to witness this head-to-head showdown. As is often the case in Muay Thai boxing, these two 130 pound war machines have been duking it out for years and last night’s big card in Bangkok was their fourth trial by combat since September 2015. Why the constant rematches? Filthy lucre aside, there is a cultural context to re-matching pugs who have already blitzed one another. In Thailand losing face, in business, sport or both, is a big deal and Panpayak was eager to regain his. Back in February, Superlek outpointed Panpayak over five rounds in a magnificent display of knees, knuckles and shins that some ringside observers wrote of as a shock win. Shock or sheer bloody perspiration, the 2017 ruck at Rajadamnern was payback for Superlek losing to Panpayak on the cards in their second bruising encounter in October 2015. But perhaps Superlek was still shagged out from their first meeting in September 2015. A beautiful display of left round kick versus knee; too close to call, it ended with a draw; one judge for Panpayak, one judge for Superlek, and one calling it dead even. It just goes to show that anything can happen in the ultra competitive sport of Muay Thai boxing. But hang on a mo… Who are Superlek and Panpayak, the lead actors in this sporting drama, this duel of champions? Rewind selector: here’s the précis for the uninitiated out there in Fightland. Quick on the draw, Superlek’s a multiple weight champ and a stone killing terminator of Buriram vintage. 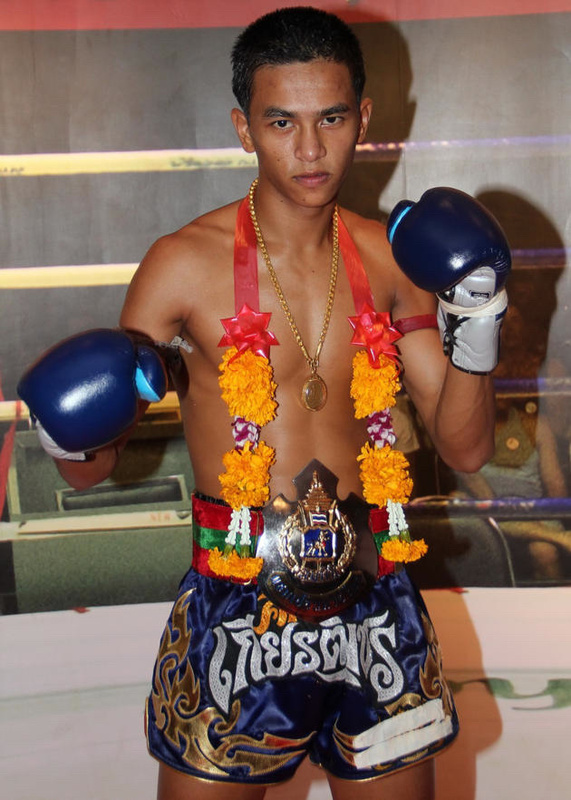 Triumphing over Sangmanee last month in a peerless display of eight-limbed mugging, and on a run of big victories, he was the odds-on favorite to win against Panpayak fourth time round at Rajadamnern. Panpayak, the man who would-be nemesis, ain’t no pushover. A champ from mini-flyweight to featherweight, the kid from Samut Prakarn (via Bangkok) is a tough stud with a glittering war record who has won the Sports Writers of Thailand “Fighter of the Year” competition three times in a row. He recently avenged a stunning loss by KO to Petchutong Or Kwanmuang, head kicked Sam-A Kaiyanghadaogym, Prajanchai PK. Saeenchaimuaythai, elbowed Wanchalong PK Saenchaimuaythaigym, and point robbed Jomhod Sagami and Aikmongkon Gaiyanghadao. At the weigh-in the day before the fourth bout, there were concerns about Superlek making the 130lb limit. Panpayak was dead on but Superlek was over by 0.8lbs. After a hasty spot of roadwork, a rather drained looking Superlek made the 130lbs cap. Drama over. Or was it? Superlek and Panpayak are two of the top pound-for-pound fighters in Muay Thai boxing, but, like seismology, the fight game is an unpredictable pseudoscience. Every winner loses and ever loser wins. Muay Thai karma or not, this main event was the big daddy and the heaving crowd in Rajadamnern Stadium were growing giddy with delight at the promise of gunfire in the ring. Who would emerge as top dog in the Bangkok alleyway? After the reconnaissance mission in Round 1 and 2, the pace went up to breakneck speed in Round 3 and the two men began to exchange bunker-buster round knees and sweeps in a death clinch. It wasn’t a policy of mutually assured destruction. One man was going to lose; another man was going to win. Would it be Superlek in the red shorts, or Panpayak in the blue? Would it be a victory by knockout or a perfunctory decision on the cards? It was too soon to tell. Battered by the winds of Panpayak’s limbs, Superlek rallied his senses in a last desperate bid for victory and launched a counter offensive of rabbit knees and sweeps off the clinch in Rounds 3 and 4 to even up the score. Panpayak boxed off but Superlek kept storming forward for old buddy clinches and socked Panpayak with some meaty looking round knees to the midsection. It was messy and violent and on two occasions both men crashed to the canvas like a brace of drunken hooligans in a pub fight. Panpayak, however, took the rough and tumble in his stride and retaliated with airburst round kicks and savage right hooks to regain control of the battle. Steely shinned and lightning handed, he took Superlek to task in Round 5 and dominated the field of battle like a latter day Roman general quelling unrest in an unruly province. A beleaguered and fatigued looking Superlek was unable to respond with any meaningful effect to Panpayak’s payload of hurt. It was all going pear shaped for the golden boy from Buriram. The winning streak, the run of luck, the yellow ink tributes from the sports writers of Thailand, none of it mattered last night in the ring. This was a Muay Thai memo to remind Superlek that he had met his fighting mirror image in Panpayak. The judges gave Panpayak the win after five hard-bitten rounds. But could Superlek’s lackluster performance be to do with his problems making weight at 130llbs? Possibly: but not certainly. Notwithstanding, it was a great night in Bangkok and the crowd seemed pleased with the unanimous verdict of the three Thai judges at ringside. Arran Sirisompan, who provided English commentary for the bout for Muaythaixtream, said much the same thing. On the undercard at Rajadamnern, Sangmanee, still wincing from his recent decision loss to Superlek, faced Kaimuakkao Petchyindeeacademy. There was a lot of Thai dancing going on at the end of Round 5 and Sangmanee won by split decision. Still in the running, Sangmanee is on the crank for revenge against Superlek. The duel of champions is over but the long and bloody Muay Thai war goes on and on.